The Needle Syringe Program provides individuals in the community who inject substances with free equipment and confidential services at all Smart Works locations. The Safer Inhalation Program provides individuals in the community who smoke substances with free equipment and confidential services at all Smart Works locations. 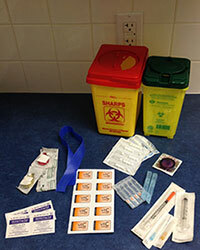 For more information on needles and sharps disposal please visit our Needle Disposal and Safety page.